Nina Pineda has more on the parking battle in Brooklyn. WINDSOR TERRACE, Brooklyn (WABC) -- There's an ugly battle brewing in Brooklyn. The turf: five spots of premium parking for area residents who blame tenants of a new building on their block for creating an active driveway and painting a curb yellow. But 7 On Your Side jumped into this Brooklyn brouhaha and found an illegal situation that even the city didn't know about in the Windsor Terrace section. "Parking over here is like gold," Brooklyn resident Peter Arroyo said. He's seeing red over a ribbon of yellow painted on the curb that's discouraging anyone from parking in front of a building in his neighborhood. Arroyo points to two new businesses, which he said took away five premium parking spots more than a month ago by painting the curb yellow on their own. We asked, "Did you knock on the door and said what are you doing?" "They laughed at us, told us to get out of here," Arroyo said. The property used to be closed off by a fence, but now part of the fence is yanked and two driveways were installed with cars parked inside. Residents said that overnight, yellow paint appeared on the curb and "No Parking" signs were slapped up. 7 On Your Side approached a man leaving the building who said he worked for one of the businesses in the building, but he wouldn't tell us his name. "I understand the Department of Buildings came out and said this, you can't just declare an active driveway," Nina Pineda, 7 On Your Side reporter said. "About the driveway, this is the way we got it from the landlord, OK? So we're not really sure about it, if it's legal or not," said the man. But that's not what the landlord told us. He said the tenants painted the curb, removed the fence and hung these signs all without his permission or knowledge. We sent the city photos, and two agencies set out inspectors. 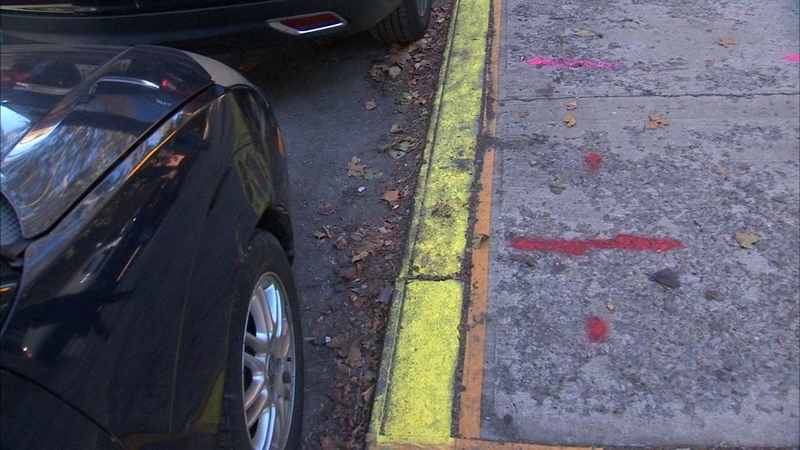 The DOT issued violations for the yellow curb paint. And then -- late Monday -- the Department of Buildings issued more violations for the illegal active driveway. Half the signs are now down, and Peter Arroyo got the spots back for residents cars to safely park. "We are so happy these signs are down and we have this street parking back for the residents, it was especially hard for the elderly," Arroyo said. "Thank you 7 On Your Side, and thanks Nina!! This would not have gotten done without you!" Arroyo said. The DOT told us the building owner has 30 days to remove the yellow curb paint, and they're going to re-inspect next week. If the paint isn't removed by mid-November (the violation was issued mid-October when 7 On Your Side got involved), the building owner will be fined anywhere from $250 to $750. The DOB told us it's illegal for cars to be parked on the property. It issued two violations, and both come with fines. The landlord will find out how much the fines are at their hearing next month.